The Santa Cruz Palace (Palace of Holy Cross, in english) is a baroque building in the center of Madrid (influenced by the architecture of Herrera). It now houses the Ministry of Foreign Affairs and Cooperation. It was used as a jail until the reign of Philip V of Spain, when it was converted into a palace. It was built between 1629 and 1643 by Juan Bautista Crescendi. Later other architects like José de Villareal or Bartolomé Hurtado García added elements. In 1767 it changed from jail to the Palacio de Santa Cruz, due to its proximity to the church of Santa Cruz. 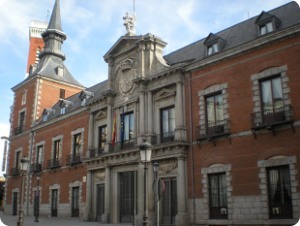 The palace was renovated twice: first in 1791 when a fire destroyed all except the facade, and a second time in 1940 after the palace was damaged during the Spanish Civil War (1930). The palace, inspired by the classic Italian and Spanish architecture, is one of the best examples of Habsburg architecture. It is rectangular, has twin-towered in red brick. The interior has two symmetrical squares, in addition to organizing space, allowing ventilation and natural light to enter, being separated by a central axis that makes both distributor and access to the building. The palace originally served as the Royal Prison. Many waited here for the verdict of the Spanish Inquisition. For most of them the next step was unfair execution at the Plaza Mayor (that it is a few meters from the Palace). No visits are allowed inside, because it's the Ministry of Foreign Affairs and Cooperation. You can only see the outside of the building. * Lines 1, 2 and 3 - Sol station. * Line 1 - Tirso de Molina station.